ProDemos is the ‘House for Democracy and the Rule of Law’. Our job is to help explain the systems that govern democracy and the rule of law, and to show what citizens themselves can do to exert political influence – at municipal, provincial, national and European level. 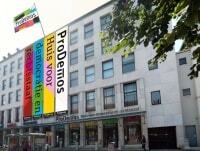 ProDemos in The Hague: Visit the Houses of Parliament! The ProDemos Visitor Centre is located directly opposite the Houses of Parliament (Binnenhof) in The Hague. It is from here that we provide guided tours, educational programmes, debates, exhibitions, courses and also venue hire. Each year we welcome thousands of students, tourists, members of political organisations and other guests, who come to find out about the inner workings of politics, democracy and the rule of law. ProDemos collaborates with municipal and provincial authorities, district courts and education institutions. Aided by our educational programmes, facilitators and lesson materials, they provide education on the jurisdiction of the provinces, the procedures in a court case, or on how to become a member of the Municipal Executive. For schools we organise political excursions, guest teachers, role-plays and lesson materials on current topics related to democracy and the rule of law: a wealth of resources for making lessons both concrete and engaging. ProDemos conducts research on topics such as citizen participation and the diversity of population representation. We also organise lectures, courses, events and debates, and issue informative publications that are often available as a free download. Our digital online tools include Vote Match and the Begrotingswijzer budget information tool. ProDemos is partly subsidised by the Ministry of the Interior and Kingdom Relations, and also receives third-party funding for special projects. We generate our own income by offering services to municipal and provincial authorities, as well as other parties. Because we are partly subsidised, ProDemos is able to offer many services free of charge. ProDemos operates according to the Collective Agreement for Welfare and Social Services (CAO Welzijn en Maatschappelijke Dienstverlening). The payscales in this agreement also apply to the Director/General Manager. ProDemos is registered under tax reference number 8230.08.721. Please read our General Terms when purchasing any of our articles or services.